My recent trip lead me to Lofoten, a small group of small Islands in Nordland, Norway. The location is famous for its dramatic mountains, white beaches and its untouched countryside. A great place to settle back and enjoy the purity of nature. Due to that, I chose Lofoten Islands for my Northern Lights Photography trip. My dream to capture the Northern Lights started in 2016. During my time in Canada (British Columbia / Alberta) lots of travelers told me that they went to Alaska and Yukon to see the Aurora Borealis. My schedule didn’t leave any space for such a long trip north. Nevertheless, I promised myself to discover these beautiful lights within the next years. And here we go! Aurora Borealis – A magical term for landscape photographers. 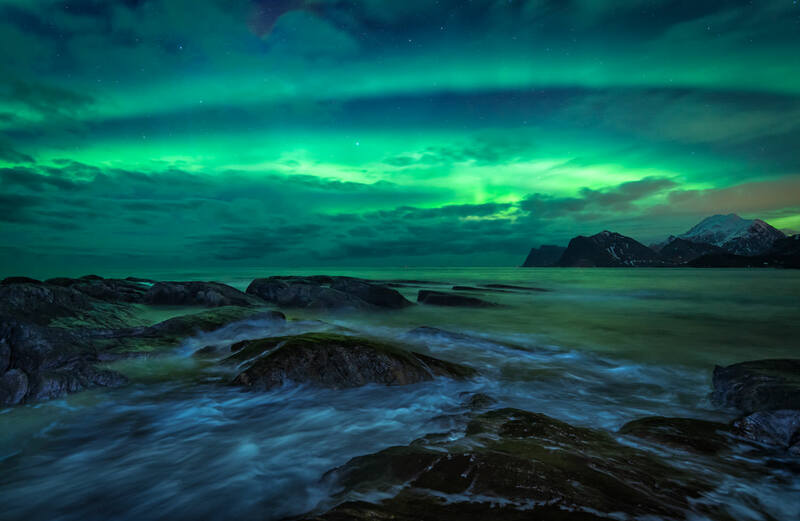 The Northern Lights combine so many beautiful attributes of outdoor photography. Due to that, its obvious that so many people want to capture them at least once in their lifetime. On the one side, Northern Lights are pretty rare, you have to travel far to find them and even if there is some activity, you need a lucky day to get a clear night. On the other hand, the lights never look the same, they always appear in a different shape and give you a surreal feeling. It somehow feels like you are standing on another planet. Aurora Borealis – Feeling like you are standing on another planet. Time of the year: Northern Lights are comparable to the milky way. They are only visible during dark and clear nights. In Norway the winter month are perfect for this purpose (long nights, short periods of sunlight). KP-Index: Even more essential is the KP-Index which outlines the auroral activity. The indicator starts from 1 (low activity) up to 10 (solar storm). In Norway a KP-Index of 2 already gives you good chance to see Northern Lights. There are several websites and Apps to check the forecast and actual activity. I can recommend the app “My Aurora Forecast” which helped me with pretty accurate results. Weather: The weather forecast is your best friend and your biggest enemy. The weather in Norway and especially at Lofoten Islands is nearly unpredictable. You need a nearly clear sky without any low clouds to spot Northern Lights. Moon: A less important factor is the moon. Depending on you location, the moon can enlighten your foreground (great for some compositions) or brighten the sky (bad if the Northern Light activity is weak). As you can imagine, it’s not easy to get the perfect aurora show. Nevertheless, you can increase your chances by traveling during the right month of the year. 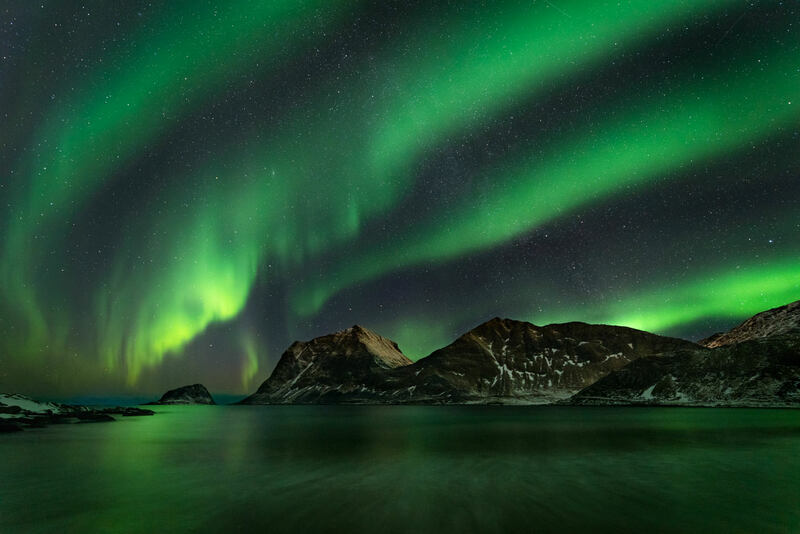 The best time to see Northern Lights in Norway are February / March and September / October. The nights are still long enough and the cloud and storm activity is not as high as in the middle of winter. Moreover, the KP-Index is still strong and gives you a good opportunity to capture the dancing lights. 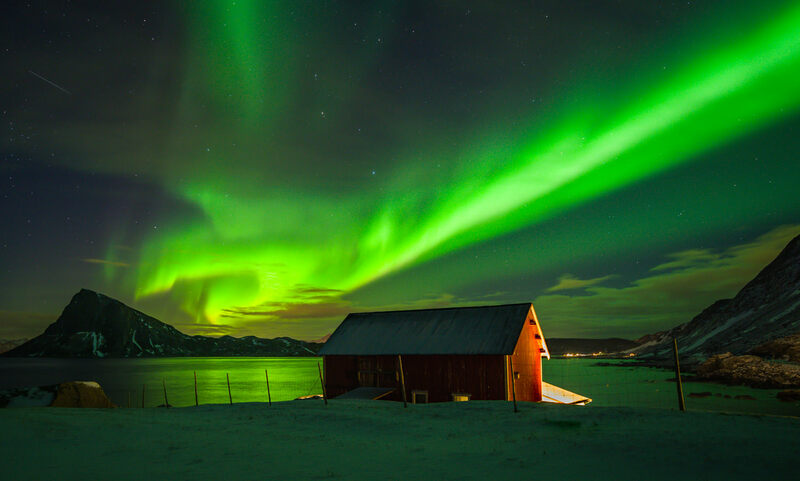 The best time to see Northern Lights in Norway: the end / beginning of winter. Lofoten Islands is one of the most famous highlights of Norway and still, one of the smallest places in terms of land mass. The reason for this popularity lies in the unique country side and the mild weather conditions. Most of the places where you can spot Northern Lights (Canada, Russia, Greenland) have to face really low temperatures during winter. In contrast to that, Lofoten Islands is highly influenced by the gulf stream which leads to human friendly weather conditions (0°C until -20°C in winter). Furthermore, the country side offers plenty of spectacular landscapes. The rough mountains, white beaches and small fishing villages create fantastic compositions for astro and landscape photographers. Spectacular Landscapes: Northern Lights at Lofoten Islands. A lot of people keep asking me “Where are the best Photo Spots at Lofoten Islands?” or “Where exactly did you take that shot?”. I won’t tell them anymore. The reason for that is simple: mass tourism. Social Media Platforms like Instagram make people dream about a certain location. They are looking forward to capturing that exact image with their own camera. The result are hundreds of photographers, photo tours and tourists who are trying to place their tripod at the same location. While fighting for the “best spot” lots of people ignore signs, warnings or even fences. A disaster for protected attractions and beautiful landscapes. Due to this issue, I try to explain to the people to develop their own creativity and explore the region and the beautiful Northern Lights by themselves. There is also a list of popular locations on google maps. If you want to do yourself a favor: take these locations as a starting point and keep exploring the Islands by yourself. Its worth it! 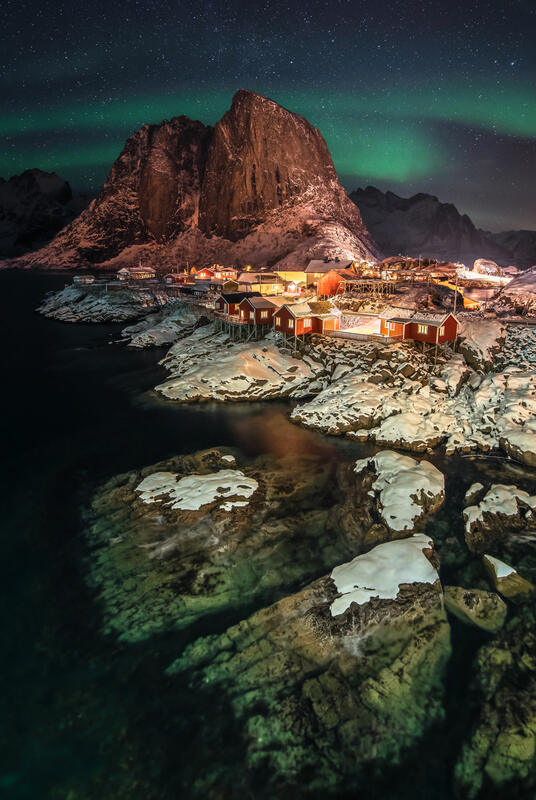 Best Photo-Spots at Lofoten Islands: Northern Lights at Hamnøy. The most important thing to capture Northern Lights is concentration. Even I, as an experienced travel and landscape photographer, had to pull myself together to take some great images. If you see the Northern Lights for the first time, you can get easily overwhelmed of this beautiful spectacle of nature. Nevertheless, don’t forget to set your camera settings and define your focus. The camera settings are hard to find. It highly depends on the time of the night and the power of the Aurora Borealis. If you have good wide angle lens and a full frame camera, I would recommend 15mm, F2.8, 10sec and ISO1600 as a start. The most important part are the highlights of the Northern Lights. If you capture them to bright, you won’t be able to get their details back in your image afterwards. Another tip: open your eyes. I nearly missed the milky way because I was so focused on the Northern Lights. As you can see in the image below, you can create outstanding composition combing both in one image. Good luck! How to capture Northern Lights: combination of the milky way and Northern Lights. Congratulation Lukas! Your images of the Northern Lights are beautiful. You’ve been really lucky to discover such great conditions. During my last trip to Lofoten Islands, I didn’t see any Aurora because of the bad weather conditions. Brilliant images! I never saw such amazing lights in a picture. I’ve visited Lofoten Islands two years ago in the summer. We didn’t see any Northern Lights, but the landscapes in the summer month are impressive too. One day I will come back during the Northern Lights season. Maybe I am as lucky with the conditions as you! Hey Lukas, your images are magnificient. My favorite is the red cabin with the spectacular aurora. It has to be amazing to watch the northern lights dance in the sky. I wish I could make It to Lofoten Islands myself in the next month.